Ariana Grande have released new music video '7 Rings' Music video, the song which is about and dedicated to her frienship with her girls. 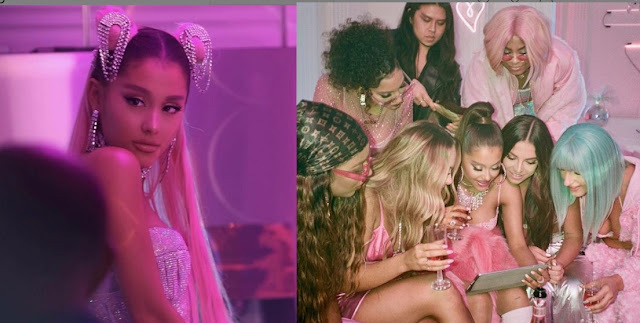 After much teasing in social media, 'Thank You Next' hit maker Ariana Grande, 25 has just dropped an epic music video of her song '7 Rings' which include a perfect barbie doll party where Ariana is having epic fun with her friends. Ariana's '7 Rings' music video is visualized and ended in a house party where Ariana and her real life friends are enjoying their time in outside the house as well as inside. The party seemed to be pink inspired from barbie or Asian theme as several time her hair seems to be inspired from various Asian gaming character like 'Chung Li'. Ariana also looks very s3xy in various of her revealing lingerie shot. Ariana's '7 Rings' is song dedicated to her friendship with her girls which is said to be just written post her engagement with comedian Pete Davidson was broken. The song is said to inspired from the event where post heart broken, she then went for shopping with her girls to mend her broken heart via shopping and even bought '7 engagement rings' for her girls with the message of women empowerment. The lyrics of the song '7 Rings' even says 'They say money doesn't solve your problems/Whoever said that must not have enough money to solve them.' Pete and Ariana broke off their five-month engagement just three months ago.